I have great news, LATB readers! Last night, I decided to create something for you all just to say thank you for being part of my online journey throughout all the years. I’ve been working in this space since 2005, and while I know that not all of you have been part of this ride for quite that long, I recognize that your time is valuable and it does not go unnoticed when you spend it with me. 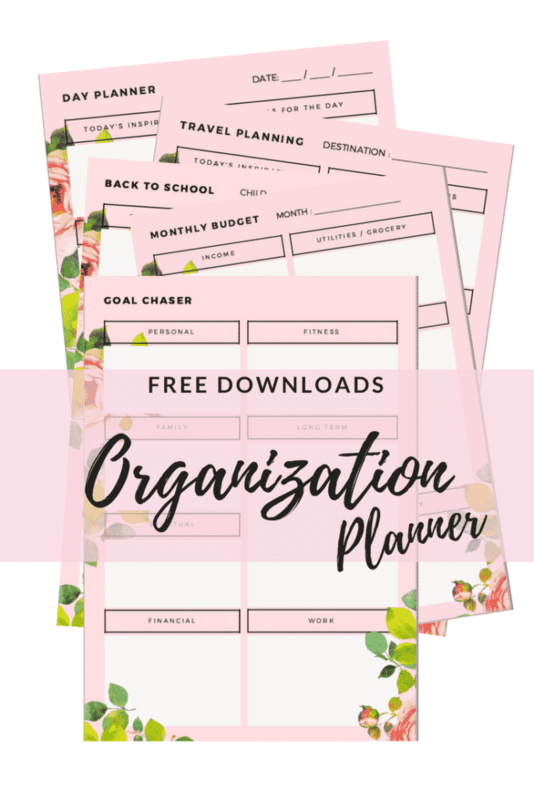 To show my appreciation, I created a free printable daily planner for you to enjoy – a home organization planner that you can use to help jumpstart this year and help get you back on the right track. Click here to download your copy. Don’t you just love free printables for home? If there are any sheets that you would be interested in me designing, leave a comment and let me know. I’d love to hear your thoughts! A free printable daily planner can be so useful. I hope you can fit it into your day. I’m always on the hunt for free printables for home because I am someone that needs a lot of help. I cannot just WING it. I am a true list maker. I need to write things down and cross things OFF. To sign up for a chance to win a $25 gift card, use the form below. Good luck! Contest expires in one month! I really really need some help in getting organized in every aspect of my life! I need to spend more time getting organized. My 15 year old son needs to get organized. He’s very forgetful. I seriously neeed to do some organizing. I definately need to learn how to organize better, both at home and work! I work multiple jobs where my schedule changes. I also have a wedding coming up. I definitely need to organize better! Me, I need to get organized, I live in clutter. My Aunt Sally needs to get organized. I would like to be better organized. I need to get organized so badly! So much stuff to sort and get rid of..
ME ME ME ME ME !!!!!! I really need to get organized. I’m a collector, but I have collected a little too much. I am not organized at home, I need some help! I seriously need organization! Especially my kitchen! I am very organized. I hate to admit it but I even organize my dirty dishes in the dishwasher! I have grown children who did not inherit my organization skills. They need help. I am in need of organizing everything in my life. My kids need to gt organized. I need to get more organized but I have procrastinated. It’s time. I always wait to the last minute before organizing, thank you! I need to get organized ! With work, and my kids will both be in school this year, I need to figure out a way to get everything done ! A few family members need to be organized. I need to get organized! Badly! I can never be organized enough! I need to get organized, especially with my closet! I would love to get my bathroom organized a bit! Oh my organizational skills definitely need work! I defintely need to get organized! I am the one in the house who needs to get organized. I really need to get organized myself! My daughter definitely needs to get organized! I really need to get organized, its so bad around here. I sure do, my kitchen cabinets are a mess, and that’s nothing compared to my schedule! Well besides myself, my teen sons need to get organized. I need to get organized for sure! I need the organization for myself and the whole family. Everyone in my family needs to get organized. My entire family needs to get organized, especially with the school year around the corner! My sister, she’s coming to visit in less than a week and I still don’t have her itinerary! I need to get organized at home. My house is a bit of a mess right now! I have five kids, so I am always reorganizing the house to keep things put away. I don’t like extra clutter. I need get organized and things on a planner. ME — I need to get organized. My daughter would like to get organized. I do cause I am a mom of 3 so I am always doing something! I need to get organized! Thanks. I am the one who needs to organize. My hubby is always saying it too! I need to get organized … big time!! My daughter needs it desperately and I can certainly do better at it than I currently do. I really need to get and stay organized. I need help. I am very disorganized. Well really who doesn’t but surely I do. Lol you wouldn’t be asking that if you saw my craft room. It is a disaster. i really need to get organized. i want to make this the best year yet. I ned to get my office and my daughters room organized really bad. My best friend needs to get organized. I have problems with sewing items, toys and papers. I really do..I am soo scattered…. I could use some organization help! My stepdaughter needs some help especially going in to high school this fall. Oh, I really need to get organized. I really need to get organized, especially for college. My oldest daughter needs to get organized. I need to get more organized and fast! I need this! Right now everything is on my google calendar, but I need a physical copy. My son and I both need some organization in our lives! I could use some help in getting organized. My sister needs to get organized. Oh my goodness I need to learn organizational skills something fierce, thanks for the chance to win. I need to get organized, I have things all over the place LOL! Oh my gosh, I SO need to get organized! Thanks and God Bless! I need to be organized. I feel like every room in my house is a mess starting with out kitchen and our garage. I need to get organized. I need someone following me all day, reading out of my organizer.